Receivers often contain narrow bandpass hardware filters as well as narrow lowpass filters implemented in digital signal processing (DSP). The equivalent noise bandwidth (ENBW) is a way to understand the noise floor that is present in these filters. 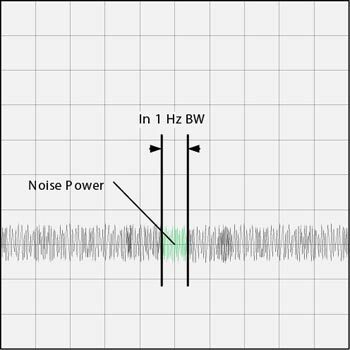 To predict the sensitivity of a receiver design it is critical to understand noise including ENBW. This paper will cover each of the building block characteristics used to calculate receiver sensitivity and then put them together to make the calculation. Receiver sensitivity is a measure of the ability of a receiver to demodulate and get information from a weak signal. We quantify sensitivity as the lowest signal power level from which we can get useful information. In an Analog FM system the standard figure of merit for usable information is SINAD, a ratio of demodulated audio signal to noise. In digital systems receive signal quality is measured by calculating the ratio of bits received that are wrong to the total number of bits received. This is called Bit Error Rate (BER). Most Land Mobile radio systems use one of these figures of merit to quantify sensitivity. 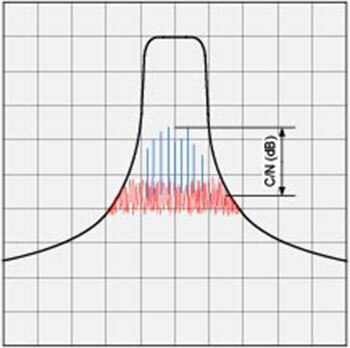 To measure sensitivity, we apply a desired signal and reduce the signal power until the quality threshold is met. SINAD is a term used for the Signal to Noise and Distortion ratio and is a type of audio signal to noise ratio. In an analog FM system, demodulated audio signal to noise ratio is an indication of RF signal quality. In order to measure the audio signal to noise ratio, typically test equipment measures total audio power (Signal plus Noise plus Distortion) and then notch filters the audio signal tone (typically 1 kHz) and measures the audio power again (Noise plus Distortion) and takes the ratio in decibels. Land Mobile radio industry standards typically use 12 dB SINAD for the measurement of reference sensitivity. Bit Error Rate is a measure of signal to noise ratio in a digital modulation system. In order to calculate the BER, a known repeating pattern must be transmitted to the radio. The receiver must demodulate the data and compare it to the known data pattern and determine the number of bits that are errors. The BER is then the ratio of bits in error to total bits received. The industry standard for Land Mobile radio is typically 5% BER for reference sensitivity. 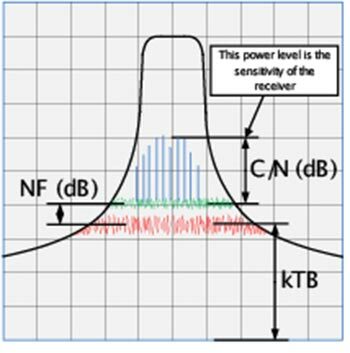 The sensitivity of a receiver can be calculated if one knows the following performance parameters: the noise figure (NF), the ENBW, and the carrier to noise ratio (C/N) required to achieve the desired quality signal. This equation defines the signal power in dB·Watts that is present at the demodulator for a desired carrier to noise ratio. Let’s explain each of the terms in this equation. The total thermal noise power (kTB) is a function of three quantities, 1) Boltzmann’s constant “k” in Joules/˚K, 2) temperature in ˚Kelvin, and 3) the overall bandwidth of the channel selective filtering in the receiver. This is referred to as “Thermal Noise” because of the dependency on temperature. This is the amount of noise power in a 1 Hz bandwidth. Figure 1 • Noise power in a 1 Hz bandwidth. The Noise figure is the amount of noise power added by the electronic circuitry in the receiver to the thermal noise power from the input of the receiver. The thermal noise at the input to the receiver passes through to the demodulator. This noise is present in the receive channel and cannot be removed. The noise figure of circuits in the receiver such as amplifiers and mixers, adds additional noise to the receive channel. 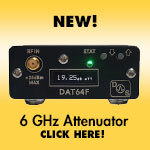 This raises the noise floor at the demodulator. What is Carrier to Noise Ratio (C/N)? In order to achieve the desired quality of demodulated signal, the signal power must be higher than the noise floor. 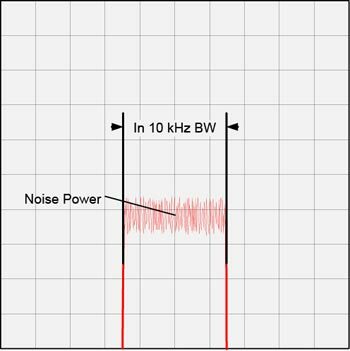 The required ratio of signal power to noise floor is known for certain types of modulation. For an analog FM land mobile radio system using 25 kHz channels, the receiver must have approximately 4 dB more signal power than noise power. This represents a carrier to noise ratio 4 dB. Figure 2 • Noise Figure added to thermal noise (kTB). Where Fb is the bit rate and B is the receiver equivalent noise bandwidth. Figure 3 • Carrier to Noise ratio. What is Equivalent Noise Bandwidth? 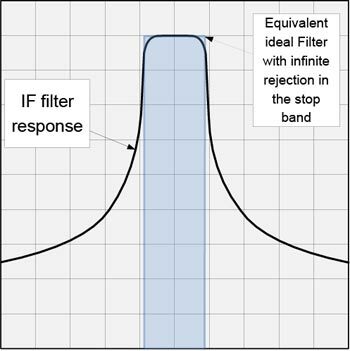 A filter’s equivalent noise bandwidth (ENBW) is defined as the bandwidth of a perfect rectangular filter that passes the same amount of power as the cumulative bandwidth of the channel selective filters in the receiver. Figure 4 • Noise Power in the IF Bandwidth. Next we see how the bandwidth of a perfect rectangular filter compares to the actual filter response of the channel selective filters in the receiver. Figure 5 • Perfect filter that passes same power. We use the bandwidth of the equivalent ideal rectangular filter (ENBW) to calculate the thermal noise floor. We may specify the equivalent noise bandwidth for design purposes but in practice, it is the composite bandwidth of all of the filters in front of the demodulator. 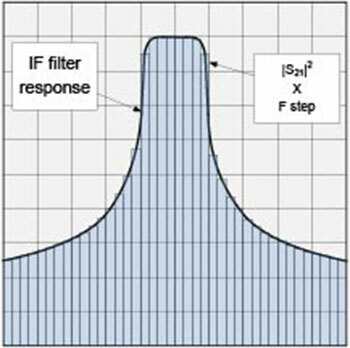 The power that a filter can pass is a function of the area under the filter curve. The filter plot is in dB. Figure 6 • Area under filter response. Figure 7 • Integration by summation of rectangles. We can use the magnitude of the through response (S21) as the voltage term and normalize the impedance to 1 Ohm to substitute into the Power equation. This will give us a linear power term. For our case we choose S parameters where the magnitude is in dB. The power must be converted to a linear term for our calculations. For the overall ENBW, we want a rectangle where the height of the rectangle is equal to the maximum power (|S21|2). 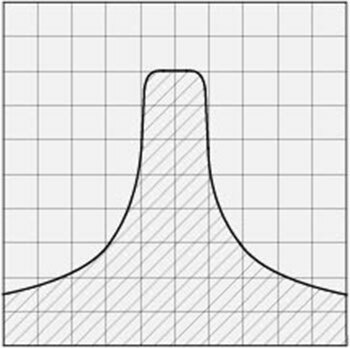 The area of the rectangular filter is equal to the area under the filter curve. Calculate the area of the under the IF filter response curve by using numerical integration by uniform rectangles. Find the area of each uniform rectangle by multiplying |S21|2 (power) by the frequency step size used in the S parameter data. Since the S21 terms are unitless we now have a result that is frequency in Hertz. The result is the bandwidth of a rectangular filter with infinite stopband rejection that passes the same amount of power as the filter that we measured (S parameters). It is this bandwidth that we will use in our calculation of the receiver noise floor (kTB). Figure 8 • Matlab code to calculate ENBW of a filter using s parameters. 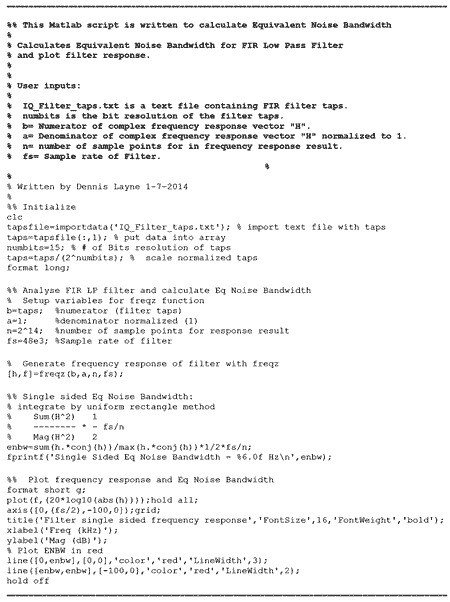 Figure 9 • Matlab code to calculate ENBW of a filter using FIR filter taps. We have quantities for each of the elements of the equation for receiver sensitivity. To calculate receiver sensitivity, we add the overall noise figure of the receiver to the noise floor. This quantifies the noise floor at the input to the demodulator. 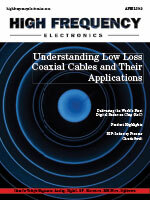 The signal must be higher than the noise floor by the carrier to noise ratio required for a desired signal quality. When these things are added, the result is the power level required to meet the figure of merit for usable information referred to as Reference Sensitivity. 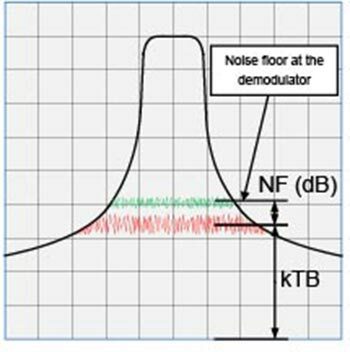 Figure 10 • Thermal Noise (kTB) plus NF plus C/N. The sensitivity of a receiver is a function of band limited thermal noise, receiver noise figure, and the required carrier to noise ratio for a particular modulation. The equivalent noise bandwidth refers to the amount that the noise is band limited. 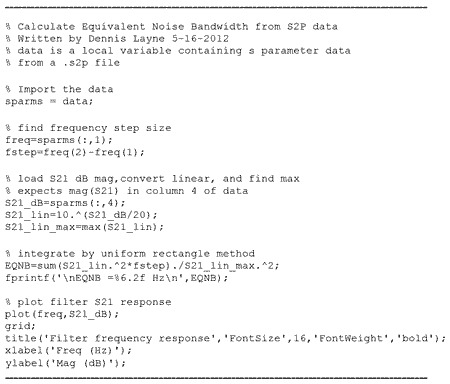 It is possible to estimate the ENBW, but it can be calculated from measured data or DSP filter taps. Using these characteristics, we can accurately calculate sensitivity of a receiver. 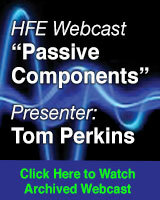 Dennis Layne is a Senior Principal RF Engineer at Harris Corporation. Dennis has a Bachelor’s of Science in Physics from Lynchburg College in Virginia and has 18 years experience designing receivers for Land Mobile Radio.